Poverty elimination is still one of the major economic policies in many countries of the world. In order to evaluate the efficacy of an antipoverty policy, it is necessary to know how much of poverty is there and observe the changes in the level of poverty over time. Poverty elimination programs also require identification of the causal factors of poverty, for example, the subgroups of population that are most afflicted by poverty. Quantification of the extent of poverty becomes necessary to address these problems. More precisely, we need an indicator of poverty that will enable us to analyze these issues. 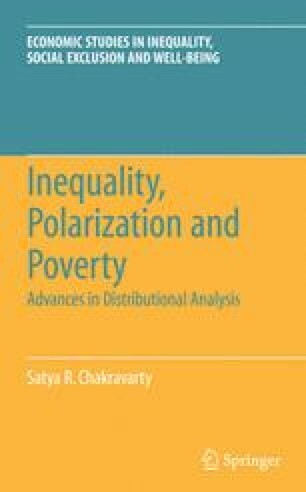 According to Sen (1976a), poverty measurement problem involves two distinct but not unrelated exercises: (i) identification of the poor, that is, to isolate the set of poor persons from the set of nonpoor persons and (ii) to aggregate the information available on the poor into an overall indicator of poverty. That is, we need to know who are poor and how poor are the poor? While identification can be referred to as perception of poverty, the aggregation of characteristics of the poor is known as “measurement of poverty.” When income is regarded as the only attribute of well-being, identification problem is solved by specifying a “poverty line,” an exogenously given level of income required to maintain a subsistence standard of living. A person is identified as poor if his income does not exceed the poverty line. Thus, the poverty line is a line of demarcation that separates the set of poor persons from the set of nonpoor persons. The aggregation exercise, loosely speaking, consists of aggregating the income shortfalls of the poor from the poverty line into an overall indicator of poverty.